If you love the idea of creating a unique, character-filled home without having to spend an arm and a leg, then your local thrift store is your best friend! Here’s my list of thrift store home decor finds that you should never pass up. You really can find just about anything at your local thrift store if you pop in often enough. We often joke that it really is the best store in our small town because you can find all kinds of really high-quality items at our local thrift stores that just aren’t available in our limited selection of regular retail stores. When it comes to home decor, the thrift store is one of the best places to find items that will really give your home a bit of character and make it feel like home. There are certain items that I’ve found are pretty common to see at thrift stores that are particularly helpful in achieving a farmhouse style look to your home so I thought I’d share some of my favourite thrift store home decor finds with you today. Make a mental note to keep an eye out for these pieces before your next visit! I don’t know if I’ve met many baskets in my lifetime that I didn’t like, but if we’re being honest, thrift store baskets always stand head-and-shoulders above the rest when it comes to character and charm. I find that I end up trying unique shapes and sizes when I get baskets at the thrift store that might not normally try using when I’m paying full price for baskets from a regular retail store. I also usually give my thrift store baskets a little paint makeover and the results are always surprisingly beautiful, especially when you consider that most thrift store baskets come to a grand total of about $1.99. Here’s where you can find the post on how I paint my thrift store baskets. My eyes were recently opened up to the magical world of thrift store mixing bowls and I don’t think I can ever go back. While they aren’t really technically decor, you can display them if you have open shelving, or use them to display fruit on your counter. I’ve always felt a little frustrated by the fact that most mixing bowls that I see in stores are kind of sad-looking compared to the works of art that I see people like Martha Stewart using, or they’re just really crazy expensive and I found pretty great loophole when I started scoping out the mixing bowl section of the thrift store. These milk glass-y bowls makes me so happy every time I go to use them, which is quite often because they’re the best. Another recent discovery of mine. Not only are the tea towels at the thrift store usually brand new-ish, they’re often pretty old and really high quality. They just don’t make them like they used to! Look for high quality Irish linen tea towels if you really want to experience what a great tea towel feels like. I often find lots of great tea towels in different colors and patterns that I wouldn’t normally buy and set them aside for a pop of color in recipe photos… then I usually realize I really like them and start using them as my regular tea towels anyway. OK, so the reason why I say that you should never pass a cute little table up is that I’ve actually left a cute little table in the store quite a few times and I’ve always regretted it. Always. These are similar to old windows in that they’re great empty-wall-fillers and they just bring an instant hit of rustic-ness to any space. Plus, they just seem to look good almost anywhere you use them. I tend to like to keep a few extras around just in case a room looks a little bare in a photo I’m trying to take. I’ll just plunk an old shutter leaning against a wall somewhere and it seems to always do the trick. I have a couple of old shuttery closet doors in the garage right now that I’d like to paint and use on the side porch as well, because it can look kind of bare out there with all the white we have going on, especially when we don’t have any seasonal decor happening. I find tons of these at the Habitat for Humanity ReStore as well so definitely take a look there! This idea is a little more aligned with my own personal taste, and might not necessarily be what most people think of as farmhouse style, but since I’m a bit of a part-time chinoiserie fan, ginger jars make me very happy. You can find all kinds of ginger-jar-shaped pieces, big and small, in the knick knack section of the thrift store. They’re often some pretty garish colors when you find them second hand, but they look amazing with a coat of white spray paint. I had a few of these a few years ago and, again, they just seemed to look right no matter where I put them… and then they broke. I’m starting to rebuild my collection now and this little guy is waiting to be painted white in the spring!…or maybe not because now that I look at this one again, it’s actually quite nice the way it is. 🙂 But some ginger jar somewhere will be getting some white spray paint! Blue and White Dishes, Vases, etc. Although this stuff has been having a trendy moment for the last few years, I’m pretty sure these will always be classic pieces. I’ve had times where I’ve displayed them, like now, and other times where I’ve just kept them tucked away in a cupboard, but I’ve never regretted adding to my blue and white collection. Not only are old books fascinating to read through, a lot of them are really beautiful and look great in a farmhouse style setting. They’re often just the little bit of character that a vignette on a coffee table or a little shelf needs to give it a little bit of personality. I have a few really old books that were passed down to me from my family and you’ve probably seen them pop up in my photos quite often. I’m hoping to grab a few more during my next thrift store trip if I can keep myself from being distracted by the cookbooks when I walk through that section of the store! What are some of your favourite farmhouse style thrift store decor finds that you’ve come across? Do you agree with my list or have I left off something essential? Great ideas, thank you. I noticed under the Old Books section, that you have wooden beads on the wooden tray. I have been trying to buy bead strands like these for ages but they are a ridiculous price. May I ask where you bought yours please? A fellow Ontarian. Love all your ideas! Hints and tips…Thank you! Keep up the good work. I’ll keep following. Thank you Courtney for your reply and I will download the Instagram app. I think those milk glass bowls are from a SunBeam mixer set. I do have a small one, it’s clear, however. I use it all the time, it fits into my microwave oven and I steam veggies in it. ALL of my dishes are thrift store items, sometimes you have to search for filling a set but that’s the fun of it. I just picked up 4 plain white plates that match mine, different label on the back but who cares! Now i have 10. The hunts the thing wherein to catch the heart of the Queen….to paraphrase the Bard! I have trouble passing up chairs! Agree on the small tables. Yes! You’re right about the bowl! It says SunBeam on the bottom and I thought it looked like it could be from a mixer, but clearly the mixer is long gone! I love that it has a spout for pouring! I have the mixer and still use it. At one time my husband put a new cord on it. Unfortunately, I broke the bowl years ago. A friend laughed when she saw me using the mixer about 12 years ago but I said if it ever quit I will buy a new mixer but was going to continue using it. I have to admit that I don’t use it very often any more. I bought it from an estate sale about 52 years ago. Some of my favorite items to look for at thrift stores (and garage sales) are ceramic pitchers, colored glass items (especially bottles, bowls, candy dishes, etc), picture frames, trays, baskets, old books for sure, and metal decor pieces that I like the shape/design of, because I know I can always spray paint them to get the color I want. I’ve also had pretty good luck finding nice lamps second hand, especially in my go-to colors of oil rubbed bronze and brushed nickel, but even old brass ones can be spray painted as well! Sometimes I also find faux florals and greenery in great condition. I don’t have much of a green thumb, so I like to make faux floral/greenery arrangements for my porch, and I don’t like to pay much for things being used outside. You’re so right about the coloured glass, Vicki! I’ve seen some amazing collections that people have put together with all thrifted coloured glass. I haven’t come across too many trays, but that’s a good thought as well! My tray that I have on my coffee table was found for me by my neighbour and I love it! Keep collecting that blue and white! It’s a classic that’ll never go out of style. I love my chinoiserie ginger jars as well. When I was young and first starting out, I had no choice but to decorate my house with dollar store finds. It forces you to be creative and use your imagination. It builds character, lol. Even though I now have a choice to shop other places, I still find myself picking up great little deals at the dollar store. You’ve given some great ideas of things to look for! I love your blog because I always learn something new from you! 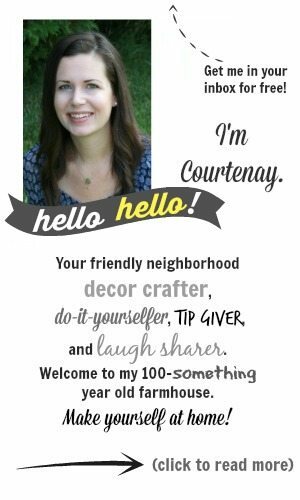 Keep up the good work Courtnay! I like your blog, as it is so down to earth!!! Good morning! That lovely floral decorated ginger jar looks way to pretty to be painted white! I’d keep it just as it is. I love going into thrift stores to rummage around. I find the neatest things! !